In the world of flooring, consumers have a plethora of options for how to best outfit their homes. From affordable laminate flooring to durable bamboo reed options, there are many materials to choose from, each with their own varieties and styles. As a premier lighting and flooring company in Michigan, the Shelby Design Center is here to help you narrow down the perfect material and style for your home flooring needs. Our carpet store in Shelby is here to provide optimal solutions for your unique style, supplying a vast inventory thanks to our Carpet One Floor & Home® cooperative. While our showroom and knowledgeable staff are here seven days a week to help customers find the best products at affordable prices, we understand that consumers like to do research before meeting with their local flooring suppliers. 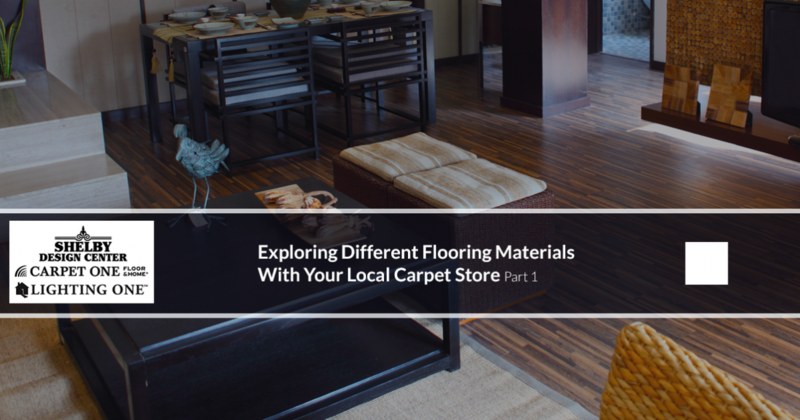 Today, we’ll begin to look at a few of the many types of flooring materials available to make your house into that dream home you’ve always wanted. When you’re ready to get the process started, be sure to stop by our lighting and carpet showroom! This elegant option provides a classic beauty that will last when taken care of properly. The sheer number of hardwood flooring styles available from many different tree species ensures that you have a wide selection to match the rest of the home. Each option provides superior durability, protecting against wear and tear. When your hardwood flooring begins to look a lot worse for wear after years of use, it can benefit from sanding and refinishing over and over again to maintain a beautiful finish. Easy to clean, easy on the eyes, hardwood can be a smart option for many consumers. While hardwood is ideal for many situations, it is not perfect. For one, wood will do little to block sound transmission, creating a loud environment for those with larger households or within apartment complexes. The natural state of this product also makes it vulnerable to outside elements, especially when the proper precautions are not taken. Moisture and temperature can work in tandem to shrink, expand, and warp the planks in your home. We recommend speaking to a flooring expert before installation to ensure that your project proceeds without any hiccups. Hardwood flooring also requires maintenance to perform optimally, from sanding and refinishing to resealing every five years or so. Anyone looking to update their home without the cost and hassle of complex flooring materials can benefit from vinyl. Often considered the flooring option with the lowest price tag and the easiest installation process, many thrifty homeowners aim to maximize the bang for their buck. This flooring option comes in a wide variety of styles and is sure to represent the easiest material for installation. Vinyl is also known for its resistance to wear, as well as ease of cleaning. It’s non-porous composition ensures that you have an optimal material for protection from moisture, making vinyl flooring an ideal material for kitchens and bathrooms. One key advantage for vinyl comes from the wide range of styles available, giving consumers the ability to match tile, hardwood, and so on. One downfall of vinyl is its vitality. While definitely more affordable, vinyl flooring tends to wear out quicker than tile, hardwood, or stone, often coming with warranties that do not provide the long-term value consumers come to expect from materials such as hardwood. The soft nature of this material also makes it less resistant to cuts, gashes, or gouges. If you drop a knife in the kitchen, vinyl flooring may be damaged. 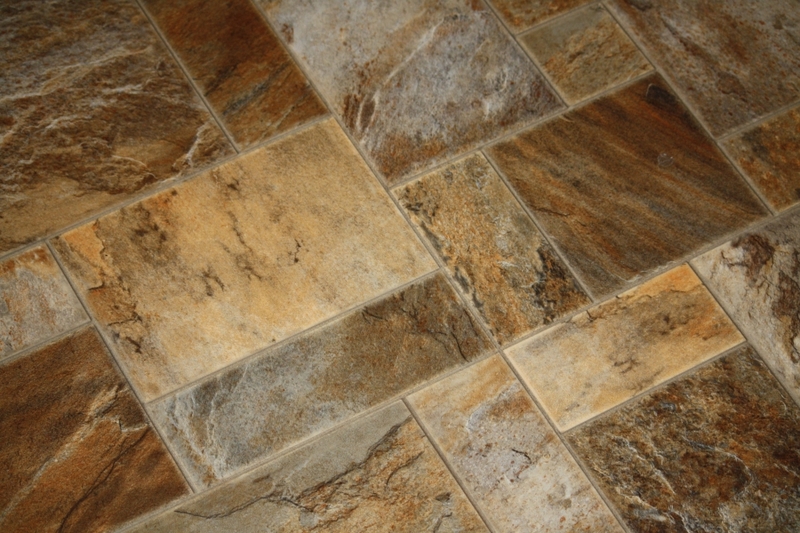 The versatility and beauty of tile makes it a popular choice for homes and businesses nationwide. Comprised of materials such as porcelain, marble, or more commonly ceramic, tiles represent a long-term investment that can provide amazing value to a property for years of enjoyment. Proper installation and maintenance ensures that you have a low-maintenance flooring material that will hold up to heavy foot traffic. Tile is also a smart way to increase your home’s resale value. While amazing for numerous reasons, tiling does have its drawbacks. The installation process can prove to be very challenging, creating a headache or the need for professional assistance, which can quickly hike up costs. When installed without radiant heating, tiles are susceptible to colder temperatures, providing little comfort during extremely cold periods. The lack of insulation makes it similar to hardwood in that there is little sound absorption. While rugs and other accessories can minimize the sounds of foot traffic, some homeowners may not like the acoustics of tile. It’s important to speak to a flooring specialist, which is why the Shelby Design Center is here to help! As one of the best flooring retailers in Michigan, our carpet store in Shelby strives to provide customers with a shopping experience that is both beneficial and enjoyable. Next time, we’ll look at a couple more flooring materials that you can use to optimize your living space. Contact us with any questions or stop by our flooring showroom today!